Happiness is a warm cookie! « Fishing in Aruba – Bummer! I have used a bunch of different brands and styles of ice fishing tip-ups over the years, and I think I have finally settled on two that I really like. This year I got my first Jack Trap (specifically the 26″ Standard). It’s not the typical ‘c ross’ design, and frankly it’s expensive – $38+. But it is made of quality components (like corrosion resistant stainless hardware and sealed hardwood), is very quick to set up and has a wind proof flag mechanism. The flag mechanism takes a little getting used to, but once you get the hang of it it’s no problem. 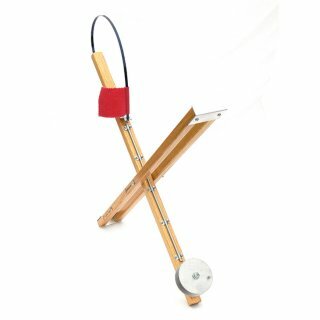 I have only seen one retailer that carries the Jack Trap, so if you’re not lucky enough to have someone local that carries them you would have to mail order. The other tip-up uses the more standard cross configuration and is the EXP-500 from icefish.com. I like this one because it has a decent mechanism, all the hardware is corrosion resistant and the wood is sealed. I was lucky enough to find these at Wal-Mart along with all the other crap tip-ups (sorry). It was still only $15, which was about the same as the tip-ups with rusty screws and flags that always pop by themselves! Both tip-ups have open reels, which I like so my depth buttons can move smoothly on and off the reel. They also both came with line and have spring loaded tension nuts. If price weren’t a factor, I don’t know which I would fill my bag with. I will likely invest in a mix and wait a couple years to see how they really hold up!